By which rules will the camp games be played (FIBA, NCAA, NBA)? First of all, the American referees and the people behind the scorer’s table are not familiar with the FIBA rules. Secondly, the measurements of the court are different than a standard FIBA court. The measurement of the camp gym is 84 feet long by 50 feet wide (25,6 meter by 15,24 meter). The FIBA standard for international competition is 91 feet by 50 feet (28 meters by 15,24 meters, meaning that a standard FIBA court is 7 feet longer (2,13 meter). However, the FIBA allows national leagues to have courts as small as 26 meters by 14 meters (85 feet and 20 inches by 45 feet and 11 inches). In addition, all painted areas and all lines on the court will be according to the (old) NCAA rules, which for example means that the three-point line will be at 19 feet and 9 inches (6.02 meter). Both the NCAA and the FIBA are in the process of changing these measurements, but we may assume that the painted areas and the lines on the court in our Pro Camp gym will remain as described above for some years to come. 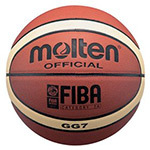 5-We will play all games in our camp with the FIBA approved “Molten G7” Basketball. This is the ball that is used in most European leagues as well as in FIBA competition (including the Olympic Games). In NCAA competition, “Wilson” is the official game ball. As a special camp rule, we will only allow the Man-To-Man defense. No Zone defenses. Which ball will be used at the games of the camp? Molten ‘GG7’. This is the ball that is used in most professional leagues in Europe, as well as in many FIBA competitions (including the Olympic Games). Will there be any additional information on the players participating in the camp? Yes. All games will be videotaped and there will be stats and box scores available immediately after each game. Player profiles on all participants are available as well. I am a coach and want to attend the camp. What do I need to do ? Do I need to register somewhere? Yes, you need to register at the entrance of the gym. After that you will have free entrance to the gym, all practices and all games. I am a player; do I need to book a hotel room after I have registered for the camp? Yes, if you don’t have a place to stay in Las Vegas you will need to book and pay for a hotel room. I am a player, how do I register for the camp? See our sign up page. Will every player get playing time during the camp? Yes, the main task of the coaches at the camp is to divide the playing time as equally as possible. A player who plays a lot of minutes in his first game is very likely to play less minutes in his second game and vice versa. The goal is to ensure each player an average of 15-25 minutes per game over the course of the camp. Where did the idea for the Euro Challenge come from? Court Side has organized the famous Pro Camp for nearly two decades and by experience we know that the roster spots for that camp are filled up very quickly. Each year we have to disappoint many talented players because our Pro Camp is sold out so soon. With the Euro Challenge we now hope to be able to offer ALL players an opportunity to showcase themselves. What is the deadline for signing up for the camp and paying the camp fee? There is no deadline. We work on the base of first come first serve until the camp is sold out. We do however, advise you to sign up ASAP, even if you can not pay the camp fee immediately but choose to do so at a later stage. Because if you have signed up, then at least we can let you know on time of the camp is starting to sell out. Why is the Euro Challenge organized in Las Vegas? Las Vegas is the global basketball hot spot in the month of July. The NBA Summer League is organized there and attracts many coaches, scouts, agents, and team officials from all over the world. In addition, some leagues have their own Draft camps in Las Vegas while agents organize Exposure Camps.